Not exciting, but oh, so worth it! Wish I had a picture that made you think, "Wow! 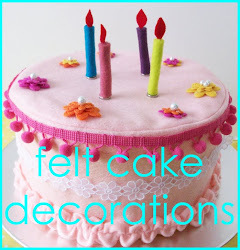 I want to make that. Unfortunately, this isn't that kind of project. But, it is one you will like knowing how to do. Just in case you are wondering--Bed Bath and Beyond has a good description of a duvet cover and why you might use it--they say it well. Now, don't buy one there (sorry BB & B! 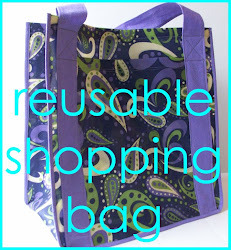 ), you can make one yourself. I am always shocked by the price of things like this because they are so easy to make. This one is plain, but even one made with fabric would cost a lot less than the ones you buy commercially. These instructions are for a twin size cover, but you can easily adapt these instructions for any size. My cover is being used to hold a down comforter and is under the pretty bird quilt so I am just using twin sheets to make the cover, but you can use sheets, fabric, or repurposed stuff. You are limited only by your imagination! Determine which side is your "right side" (the one that faces out on your finished cover or the outside) and which side is your "wrong side" (the one that is not showing or on the inside of your finished cover). This is easy if you are using a sheet because one side is clearly the inside and one the outside. 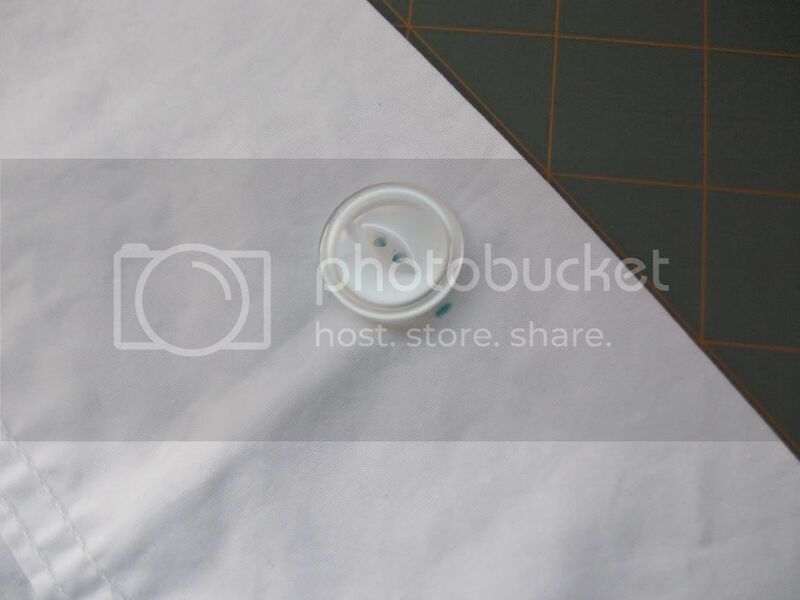 This picture shows the wrong side--this is where I am making my marks for the button holes. Find the top center of your sheet by folding the sheet from left side to right side and creasing the fold with your fingers. Open out the sheet and mark where the crease it. Make your mark about an inch down from the top. 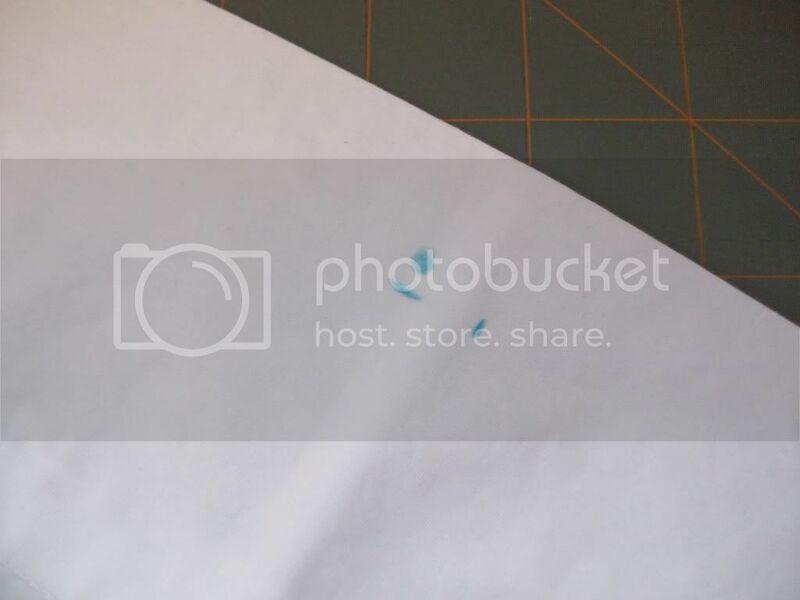 Your first button hole will be centered on this mark. 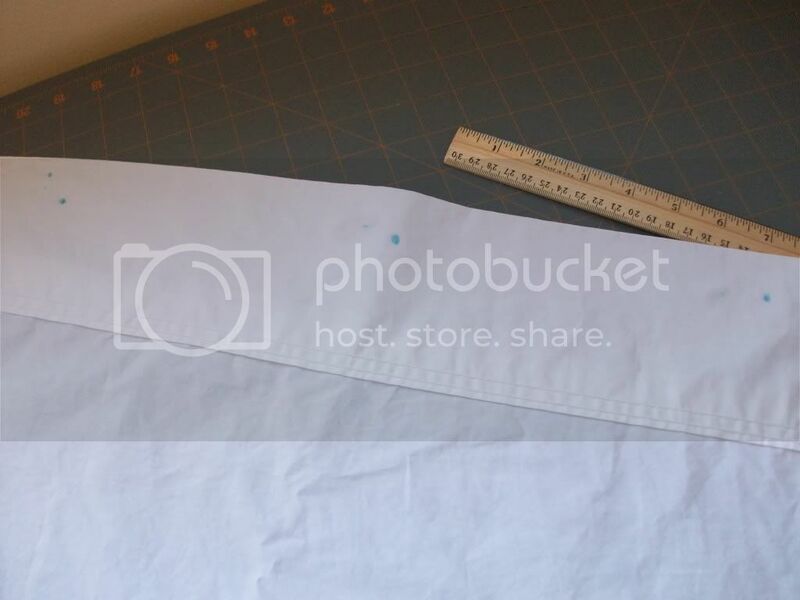 Now, you need to determine how many and where you want to put your other button holes. This is not an exact science (for me!) and you can fudge a little here. I measured about 8 inches from the edge and made a mark. It actually wasn't on the edge, but that doesn't matter. 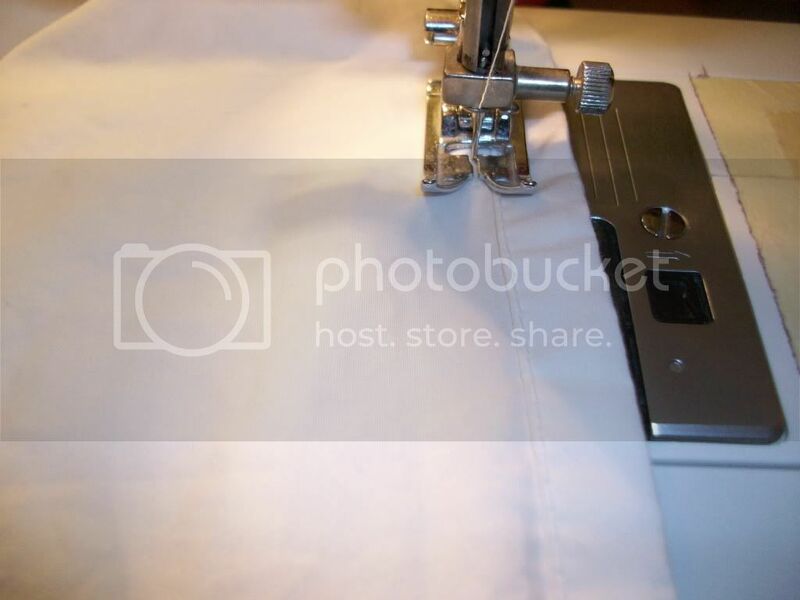 Look at how much space you have between your center button hole and the one you just marked. I decided I needed about three buttons in that space so I eye-balled about how far apart they needed to be an end up roughly the same and then measured it out to make it even. 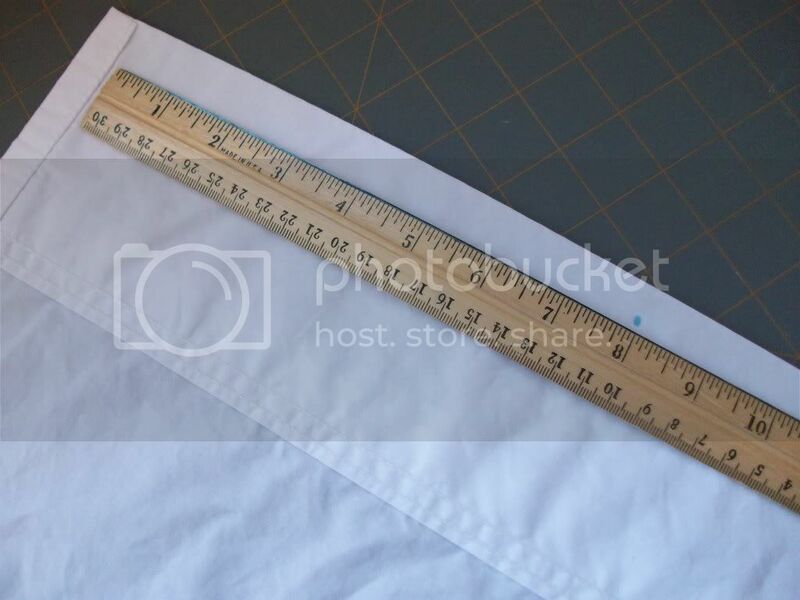 Mine was 7 1/2 inches--remember this can be different depending on how big your buttons are and how many you have. I wouldn't go closer than 6 inches and more than about 9 inches apart. You can see how I adjusted a little. Do this again on the other side from the center to the edge. 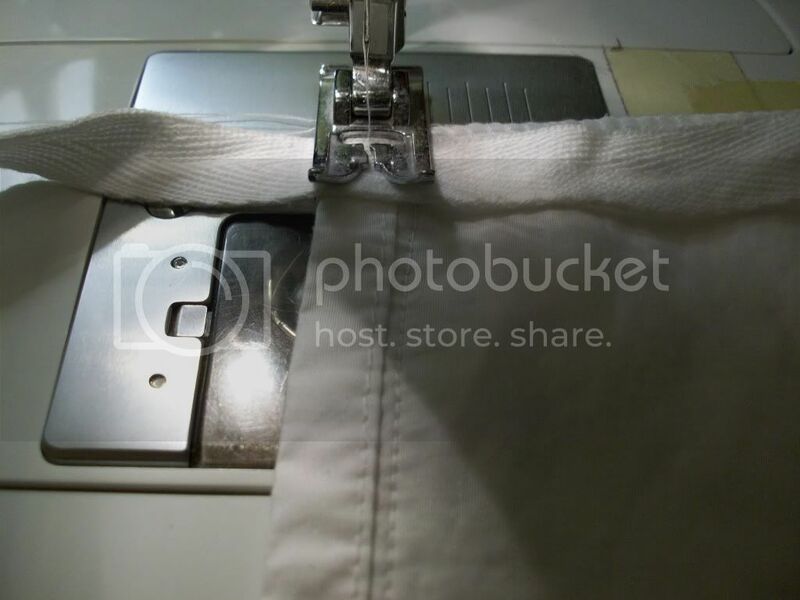 Making a button hole on my machine starts at the bottom of the button hole so I wanted to mark where to start the hole. First, I made sure the marks were one inch down from the top edge so that everything would be the same. 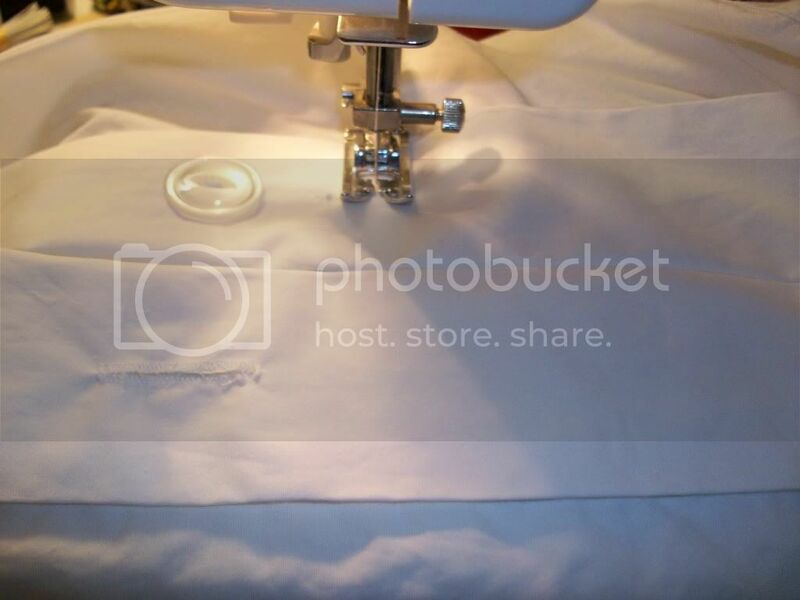 Make your button holes from left to right on your sheet so that there is some room for movement. I needed to mark the side which is the bottom of my hole when my machine makes the whole. To do this, center a button on the mark and mark the edge of the button. I used one inch buttons so this all looked right to me. You may need to adjust a little depending on the size of your buttons. This is a little confusing because there are so many marks. 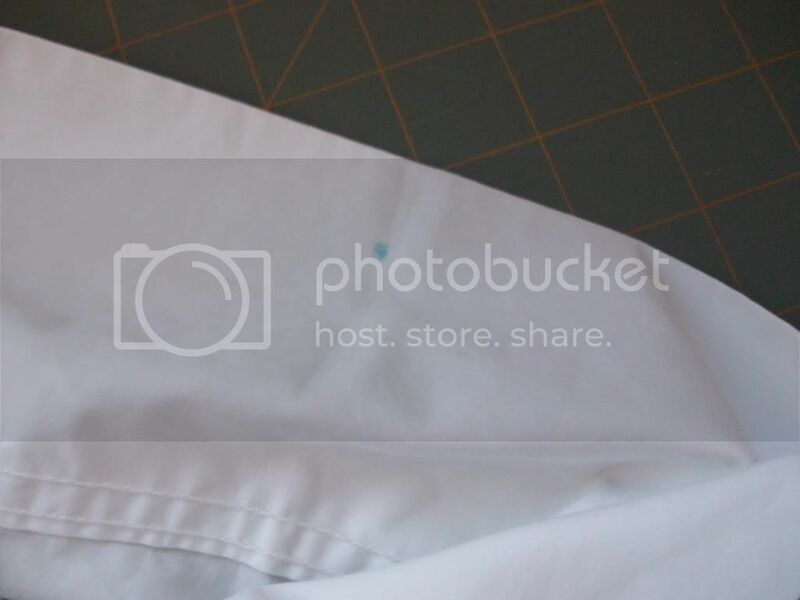 Make your button holes. Remember, the first and second marks you made were the center of your holes. The last one is for the left or right side of the hole depending on which way your sheet is turned. 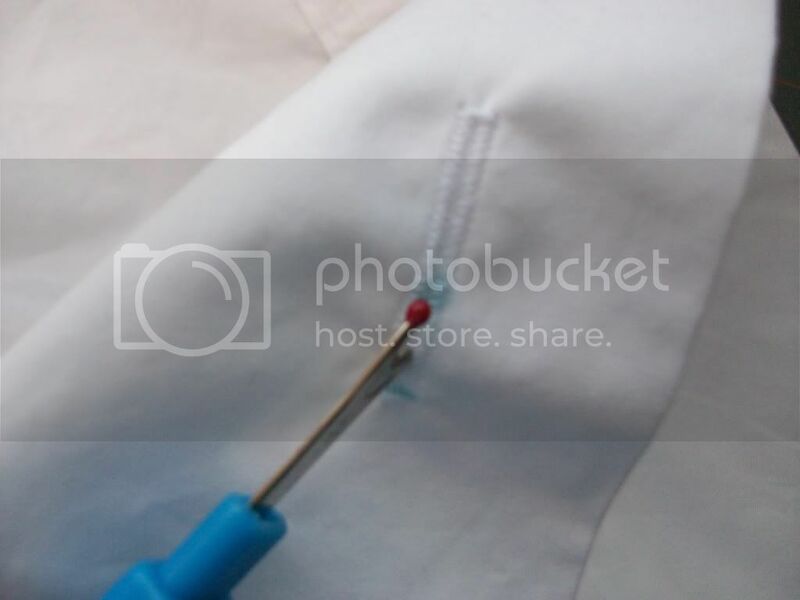 To make the hole, poke your seam ripper in the middle and make a small hole. 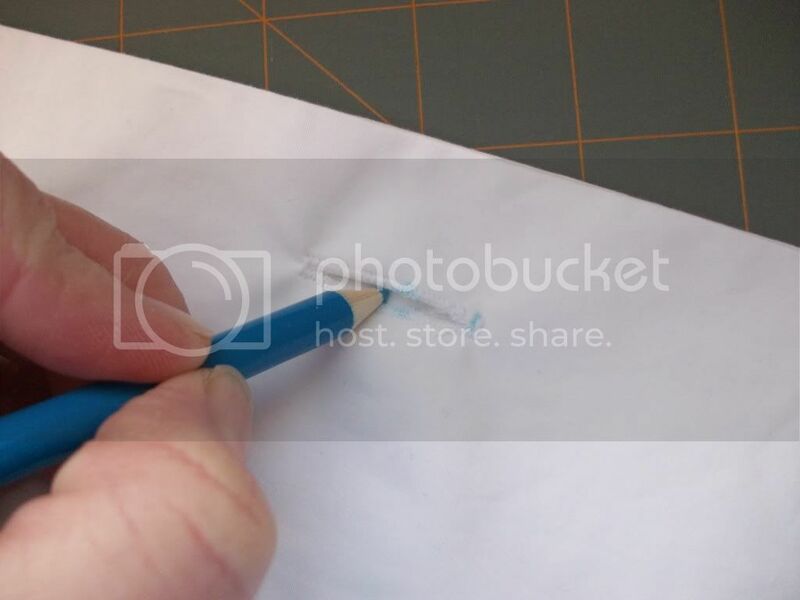 Using the hole from the seam ripper, poke the tip of your scissors in and carefully cut the hole from end to end without cutting through your stitching. To put on your buttons, you will need to mark where they go. 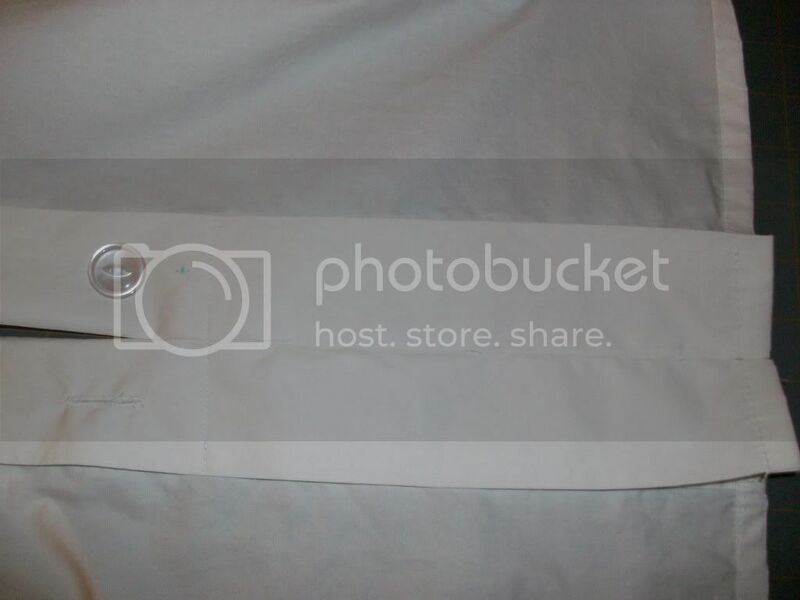 The easiest way it to line them up with your button holes that are already made. To do this, place your sheets together with the button holes sheet on top of the right side of the other sheet. The top edges should be even. This works best if you spread out on a large table or on the floor and make sure you are lining everything up as careful as you can. Be careful here! 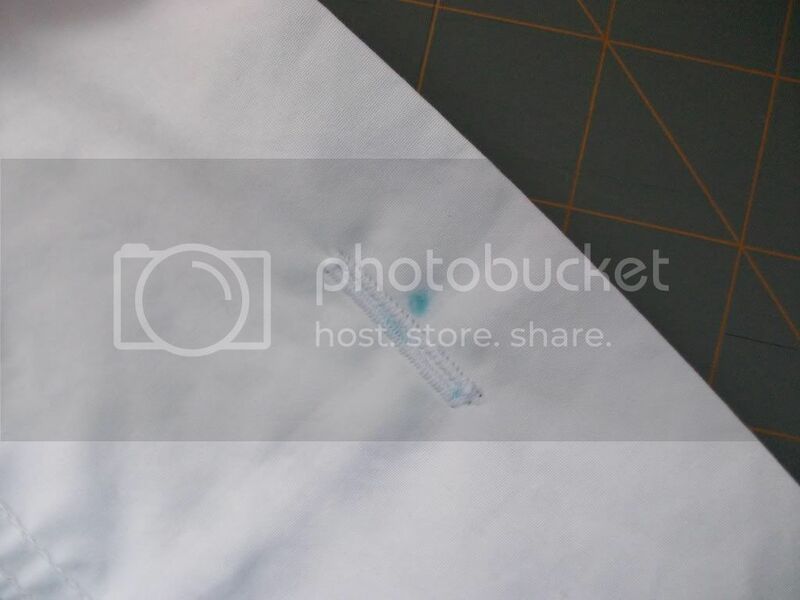 It is really important that the sheets are turned the right way and the marks are on the right side. The right sides of both sheets should be facing each other or right sides together. The wrong sides should be facing out as if the whole thing was turned inside out. 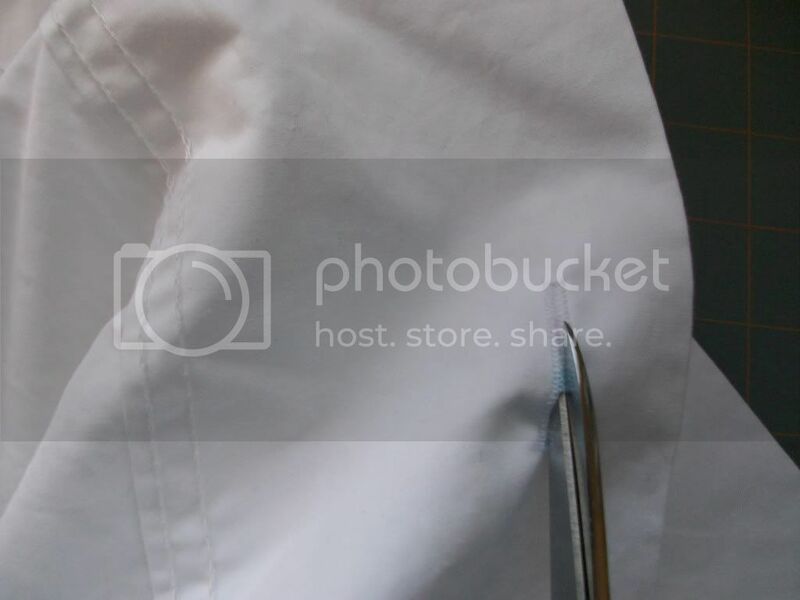 Stick your pencil through your button hole and mark the center of each button hole. 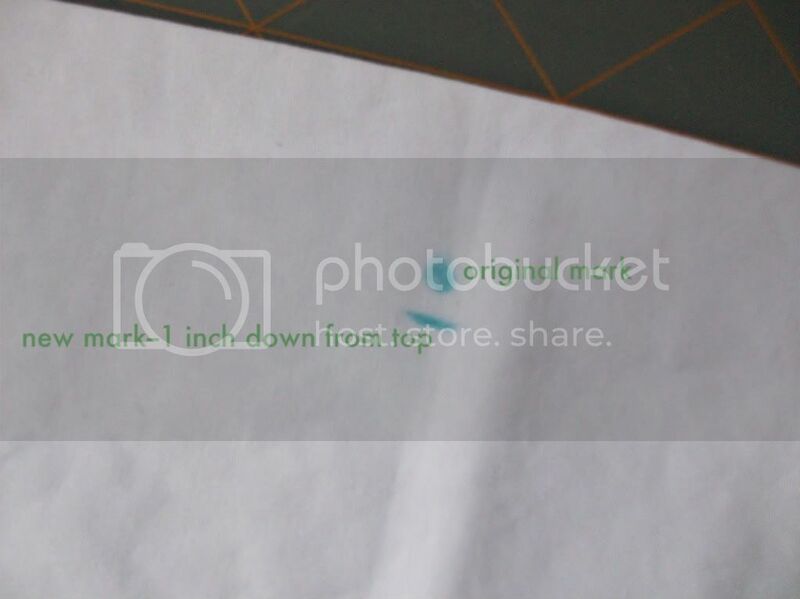 This is what it looks like after you made your mark on the right side of your second sheet's top edge. Next fold down the top edge with your buttons. 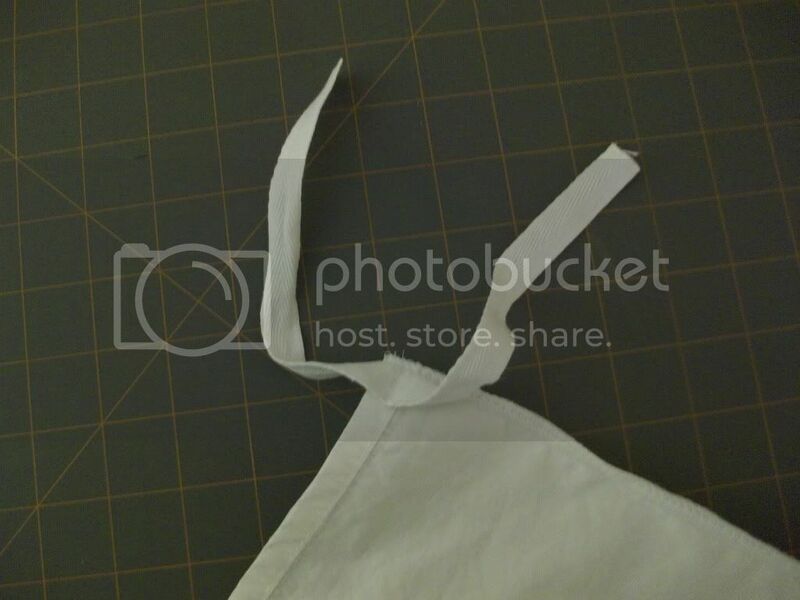 I folded mine down to the bottom edge of the original top edge hem (it is pretty wide generally). 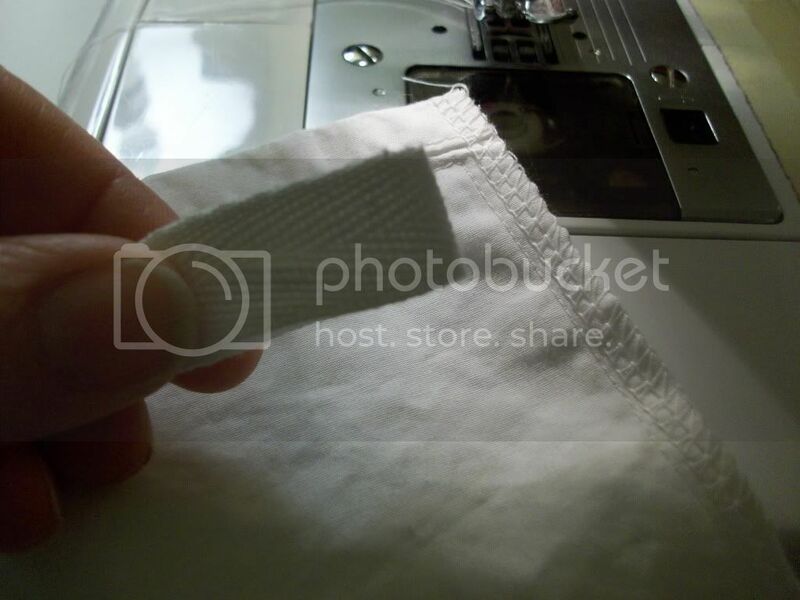 Make a crease on this fold by ironing it with a hot iron from the side edge to the first button. Do this on the left and right sides. Now you are going to sew the sheets together at the top, but just on the outer edges. Open out fold. Place sheets right sides together. 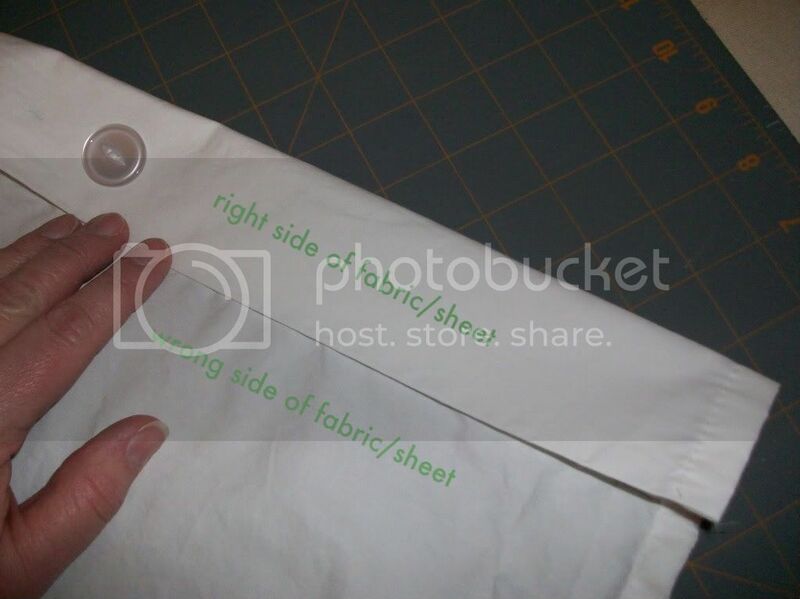 Using the folded crease as a guide, stitch sheets together from the side edge close to the button. I stopped about 1 inch before the button. Do this on both sides. It looks like this when you are done. You are looking at the inside (wrong sides) of both sheets. The top part that is folded down is actually a right side on both sheets, but it has been folded to the inside and has now become a wrong side. A "standard" twin sheet is about 10 inches longer than a "standard" twin duvet. 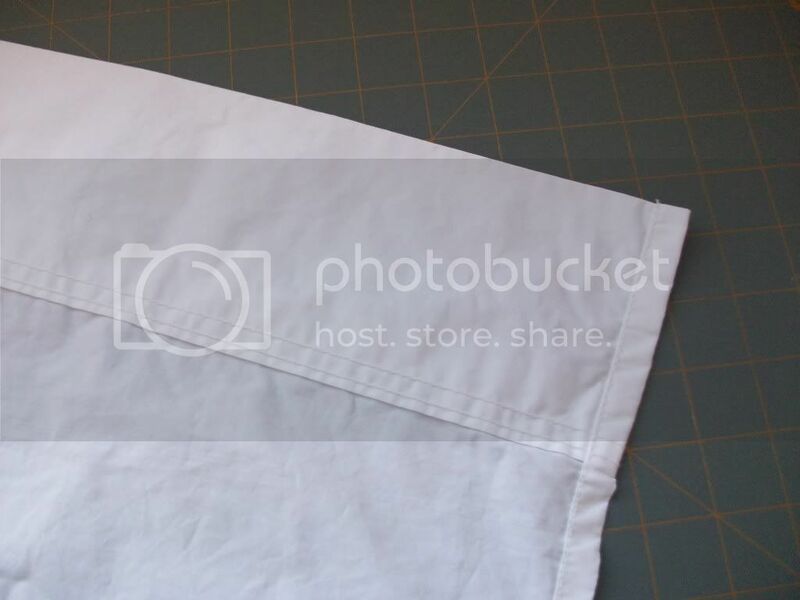 Since we used up some of that length with our button placket and will use some with a hem, you will cut off about 8 inches from the bottom of both sheets. If you lay them carefully together, you can cut them at the same time. Be sure to spread them out on a large table or the floor. If they aren't lined up, it makes the hems really awful. 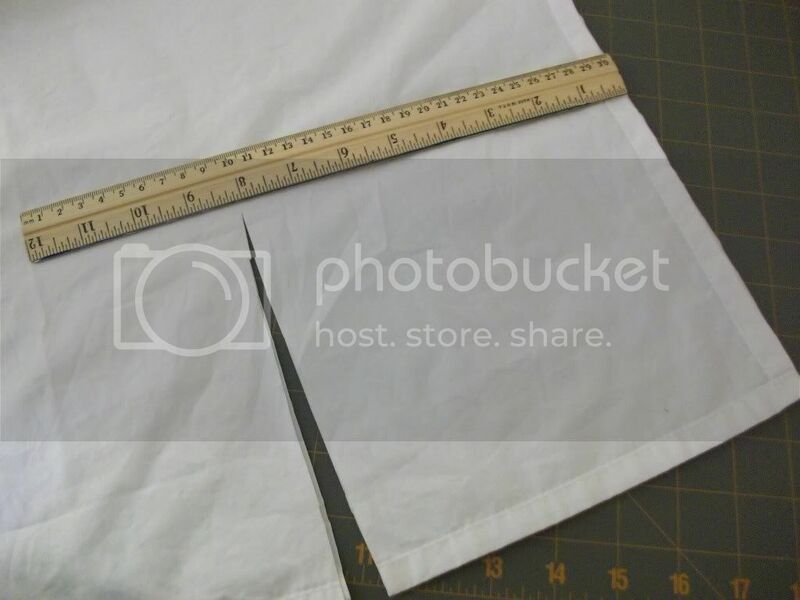 Hem the sides of your sheet by putting right sides together. I sewed from top to bottom on each side before I sewed across the bottom. My bottom edges weren't exact even though I cut them at the same time. Do not worry about this, but sew across the bottom last so you can compensate for it. 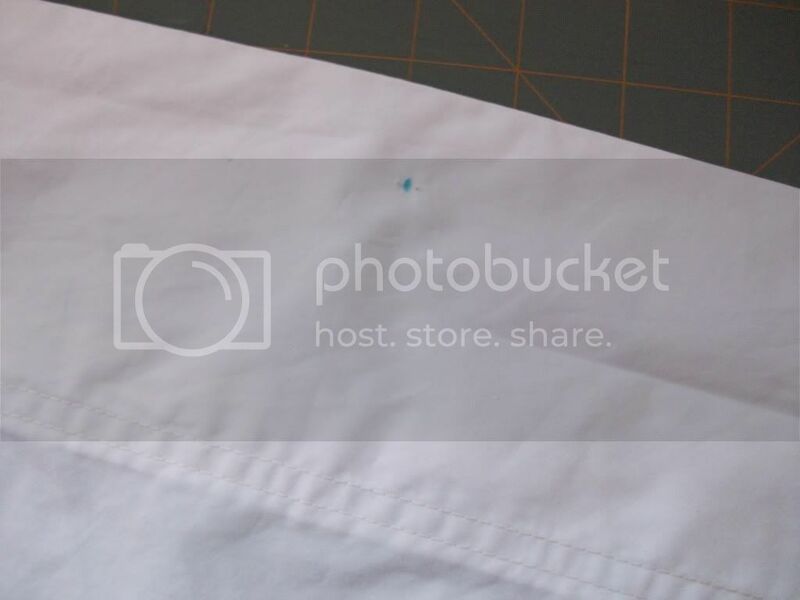 On the sides, I stitched right near the finished hems on the sheets. On the bottom, I lined it up as best as I could and sewed about 1/4 inch from the shortest sheet edge and then serged it to make a nicer edge. Now we need to do ties to hold the comforter in better. I use twill tape, but you can use bias tape or make ties from the scraps you cut off from the extra length of the sheets. You will need at least 4 ties. You can do more, but I am comfortable with four. My ties were each 12 inches long. I tie my comforter to them with a know--I don't mind picking it out when I wash everything because it doesn't need washed frequently (Does that sound gross? 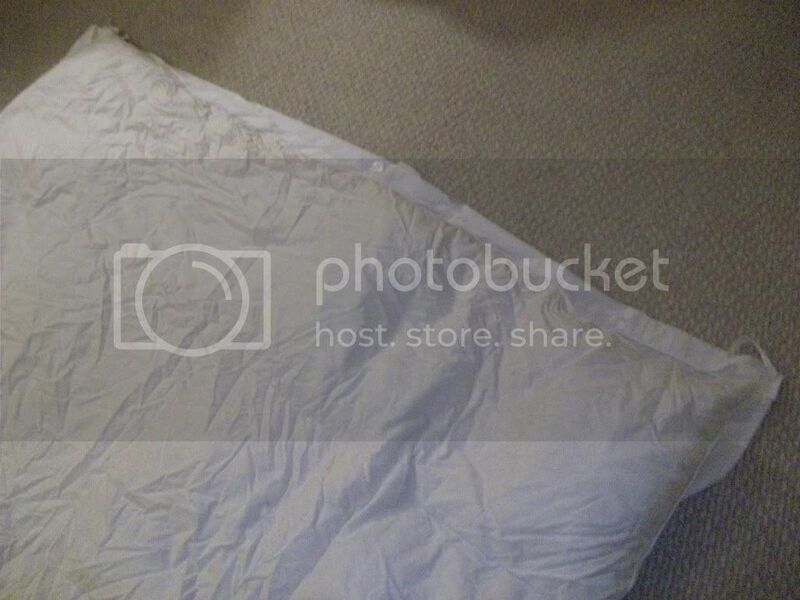 Remember, though, mine is sandwiched between a quilt and the bed sheet) and it holds really well. If yours needs to be washed frequently, I would make them 24 inches long and tie your comforter on with bows instead of knots. Some people pin them on, but I don't want the pins in there--it just seems like an accident waiting to happen to me. After all of this, who wants to have your lovely cover ripped by the pin? First, fold your tie in half so you know where the center will be. 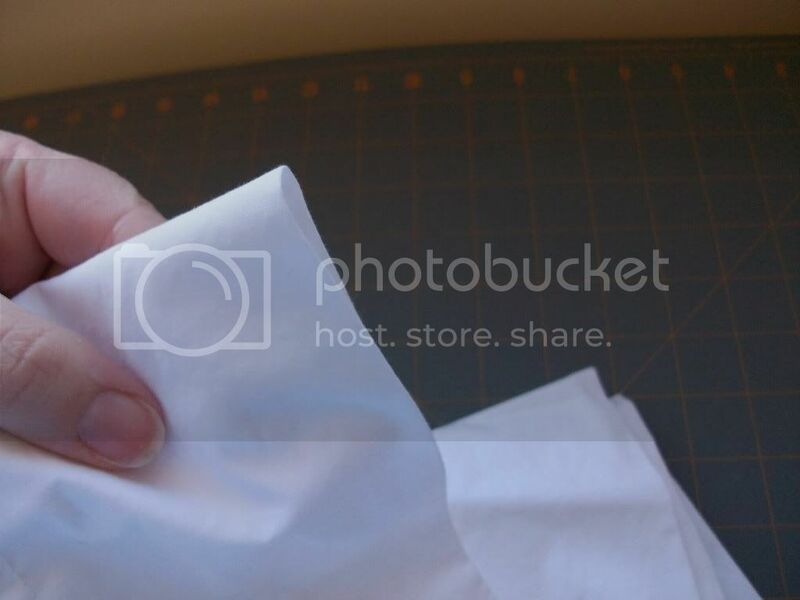 Make a mark on the center or make a fold crease. Next sew the center of the tie down in the seam space of your cover. 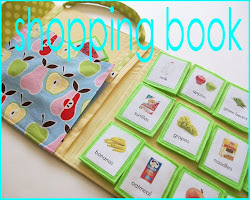 You will need to sew one in each corner. 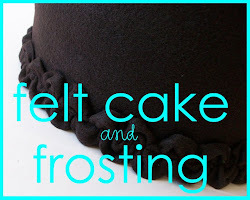 Be sure to sew them all on the same side--do not flip your cover over while doing this. Next, lay your cover flat on the floor, inside out with the ties on the side facing you. Spread your comforter over the top. This is why you don't want the ties on opposite sides or sheets. 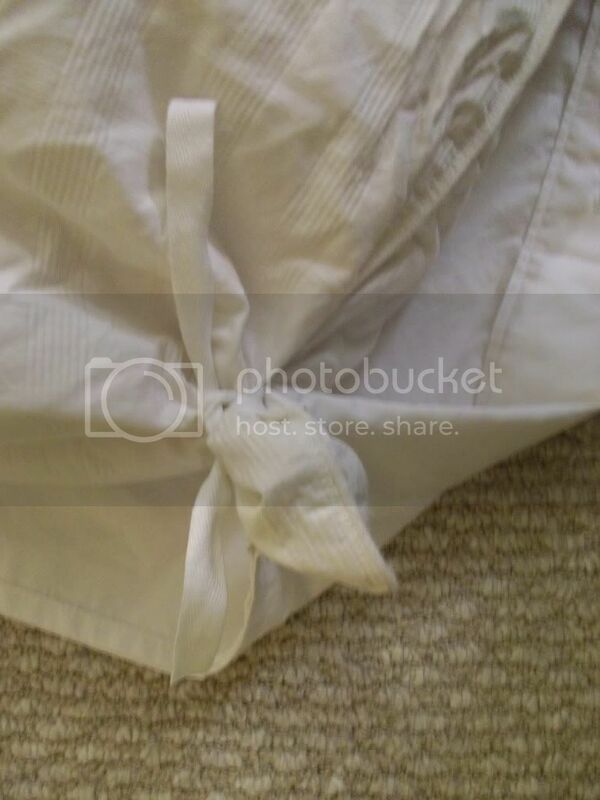 Tie each corner of the comforter securely with the ties. If you sewed more than 4 ties (the sides maybe) you will have to grab part of the comforter and pull it into a shape that can be tied. 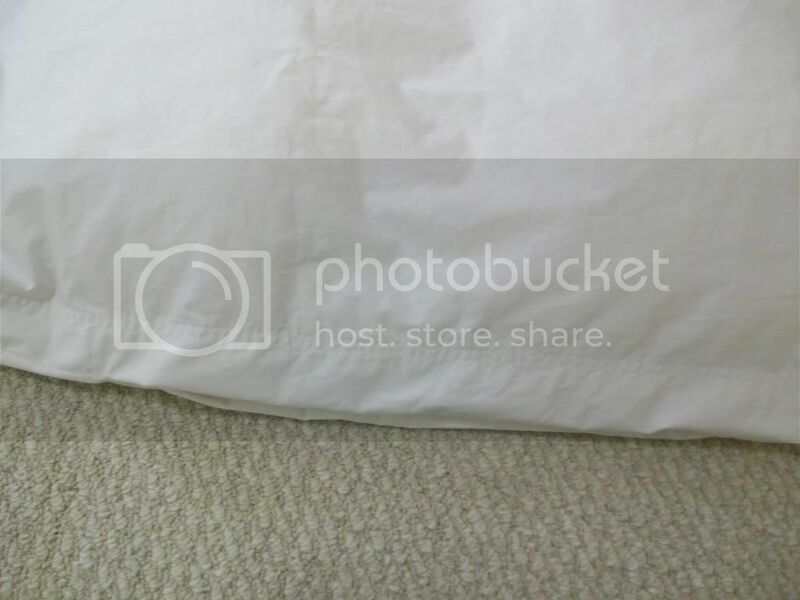 I have found that four hold just fine for a twin-size or queen-sized duvet cover with down comforters inside. Now, carefully flip the whole thing right side out. Trust me, this is the easiest way--I have crawled inside before to tie these and felt like a fool. This way is much better. When you turn it all right side out, watch your sewn edges at the top. The top edges with the buttons and the button holes will fold to the inside and you just need to slide all of the buttons into the holes. It should looks smooth and pretty without all of the buttons getting into your way. Now, it isn't exciting and the tutorial is really long. Trust me, though, it is really easy to do and you will be so glad you know how next time you need one and you see the price tag! The best part is that you can change your color schemes and themes in your bedroom on a whim when you know how to make such an affordable and easy duvet cover. Oh yeah! I found you! I've been wondering what kind of crafty stuff you've been up to. I meant to tell you thanks for the super cute countdown blocks, but didn't get the chance...should've just called.